Business Continuity System Built 50% Faster While Saving "Tremendous Amount of Time and Money"
"With Alpha Anywhere, we've created a web-based solution that has reduced our costs and the costs for our customers, reduced our time to market, and helped us gain a leading position in an important industry. I don't know of any other rapid application development platform that even comes close to Alpha Anywhere's capabilities." Uplanit is an Australian-based company that provides business continuity IT disaster recover consulting for large private and public companies, including hotels, power companies, investment companies, casinos, and others. 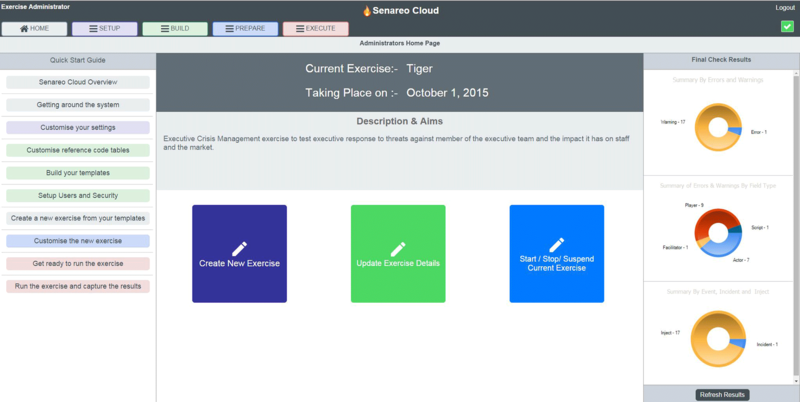 Uplanit runs exercises and creates scenarios to test how prepared companies are for disasters. Using paper-based scripts, the company creates disaster scenarios and records how participants respond to them. Uplanit then evaluates and scores how businesses react. In many instances, simulation exercises are a regulatory and audit requirement. Uplanit was using a paper-based exercise planning system to help its customers improve their business continuity and disaster planning. Uplanit consultants would go onsite to an enterprise client, and utilize paper "scripts" to present and run an emergency scenario for an enterprise client's employee base and capture those employees' feedback. "Creating the scripts on paper was extremely time-consuming," says Steve Power, principal consultant for Uplanit. "It took a great deal of work to get the scripts to the participating employees. Calculating the results would take several weeks. It was also problematic trying to collect participant and observer feedback via paper." Using paper created other problems as well, such as not being able to easily change scenarios. Reading from paper scripts did not offer the kind of interactivity Uplanit wanted to offer. And creating, distributing, and using paper-based scripts was time consuming and expensive. "We knew we needed a new system," Power says. "We wanted a web-based platform that would reduce costs, improve flexibility, and give the scenarios a greater sense of reality by using technologies such as direct messaging. We also wanted a platform that could scale as we ramped up the business." "None of the other platforms offered the right balance between ease of use and hand-coding." Uplanit is a small company with limited resources, no sizable in-house IT staff, and no background in web-based development. Because of that, it decided that a rapid application development (RAD) platform would be the best solution for creating a web-based system. After initial research and testing, it quickly chose Alpha Anywhere. "We recognized right away that Alpha Anywhere was the only product that could do what we wanted with the resources we had, and in the shortest time possible," Power says. "The no-code and low-code approach was ideal for us. The people on our staff who were going to be the developers were also the knowledge experts, so no business analysts were required to translate the requirements. This is a big plus for Alpha Anywhere." Power does not have a web-development background, but using Alpha Anywhere he built much of the web-based system himself. Participants see the scenario unfolding on the Alpha Anywhere web app, and have to react to developments in real-time. Videos delivered via the web app give the exercises a greater sense of reality. People can participate from many different locations by accessing the app via mobile devices and the web. There is also far more interactivity than when paper is used. With Uplanit software, companies can build their own library of exercises and reuse the content to create a new exercise in minutes. They can customize the content from one central location, making it easy to manage the information. Companies can also access and revisit the executed scenarios via the web app later, which makes them more effective and useful. The app also makes it easy to rate how well companies did during the exercises, and whether participants thought the exercises were useful. All participants can respond to online questionnaires via their phone or tablets, making it easy for Uplanit to do its evaluations. "We recognized right away that Alpha Anywhere was the only product that could do what we wanted with the resources we had, and in the shortest time possible." Uplanit and its customers have reaped considerable benefits from use of the Alpha Anywhere-created system. Particularly important is that Uplanit was able to launch the system far faster and at far less cost than if it used other app development methods. "We built the entire system from scratch in a year using two developers— and it would have taken a team double that size at least twice as long if we had used another tool to create it," Power says. "So it saved us a tremendous amount of time and money. " That faster time to market is important, Power says, because, "We're one of the early entrants to this limited vertical market, and that's one of the keys to our success." Scenarios and exercises can be created far more quickly than previously because of the ease of building them online rather than on paper - and because existing templates and scenarios can be re-used. "Because of that, instead of taking three to five weeks to create scenarios, which is how much time it used to take, they can be created in hours," Power says. Scenarios can be changed on the fly. The videos and interactivity makes them more realistic, which leads to better training. Feedback can be obtained instantaneously. Uplanit also built a subscription and billing system, which makes it easier for customers to pay online. "Using Alpha Anywhere, we've brought disaster exercises and scenarios into the modern era," Power says. "It's helped us reduce costs, please our clients and expand our market share and customer base - and happier customers are loyal customers. Alpha Anywhere has been a win all around." "We built the entire system from scratch in a year using two developers— and it would have taken a team double that size at least twice as long if we had used another tool to create it. So it saved us a tremendous amount of time and money."